In Angarsk we have erected a two-level retaining wall using our Terramesh System. The wall is to protect the city from the Kitoy River eroding the bank when the water is high and causes flooding. The protective structure was planned as a result of a flood caused by an extra-tropical cyclone in 2001, which cost ₽251 million (circa US$4 million) to repair. The Terramesh System’s ease of installation enabled the works schedule to be shortened, so the project was completed by the start of 2018, a full year ahead of the fixed contract’s term. The total length of the stabilized bank boundary was 1,200 m.
To protect Angarsk city from the impact of river erosion, the city district’s administration decided the caving bank on the Kitoy needed to be conserved with a protective dam. 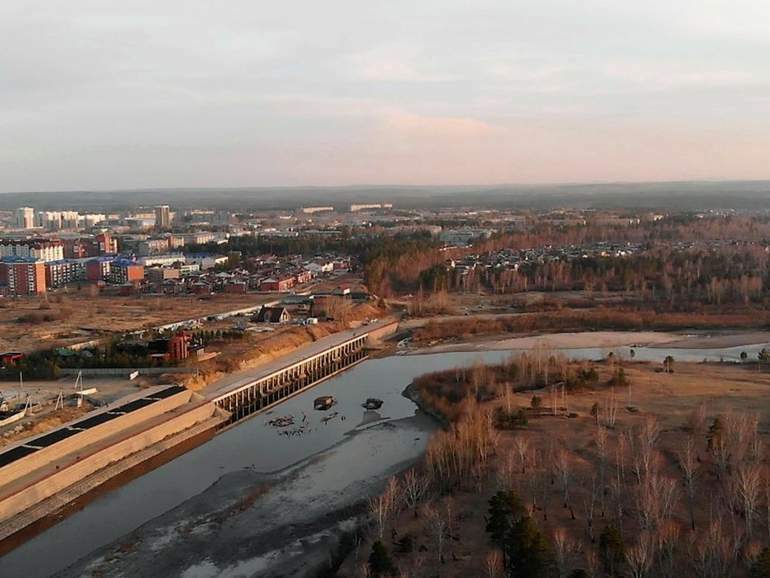 The plan stipulated that the total length of the river side that was to be protected was 1,200 m. Of this, 400m was in the city’s Kirov area, and 800m in the Staritsa area. It was designed so that the protective dam was constructed using reinforced soil made up of two levels of gabions measuring 6m in height and divided by an intermediate shelf or berm in the form of a 10m wide road. The erecting of these flexible gabion structures was done manually. The fact the installation was not overly laborious and minimal equipment was used meant work performance was speeded up and the project was completed ahead of schedule by the turn of 2018, a whole year earlier than the contract’s term. The stabilization of the Kitoy river bank project is an important stage in the development of the Angarsk municipal district. Kitoy is one of those rivers that suffer from summer floods. Every flood involving the Kitoy causes the river bank to become concave removing tens of meters of land. Bank protection was urgently discussed after the 2001 flood, when 342 apartment blocks and more than 13,000 garden plots were under water, and 33.5 km of roads were washed out. In 2014 a special commission including officers from the ministries of Emergency Situations, Nature, Rostekhnadzor and the Federal Agency for River Resources was established. Having examined the two sites – in Kirov and Staritsa - specialists concluded the relevant works should start immediately. Our Terramesh System proved to be the most optimal solution for protecting the bank from erosion. The way the Terramesh System works is as a channel that regulates structures to limit the impact of a river’s hydraulic shear force, preventing river side erosion and scour. The flexibility and permeability of the structure is what enables the rapid dispersion of water pressure behind the structure. This capacity is especially important in potential flooding zones. To select the appropriate parameters of the reinforced soil system for the Kitoy river bank protection project, Maccaferri experts calculated the stability of the support wall using our specialized MacStars software. The new embankment connects the old part of the city with the residential quarter. In addition to the immediate task of bank protection, the dam also makes it possible to develop a place of rest for the citizens of Angarsk. A viewing platform, a family recreation area, playgrounds and bikeways are also being created by the riverside. The Mayor of Angarsk, Sergei Petrov, said that in future stage 2 of the embankment is planned with a 2km-long section that will connect the reconstructed sites. When it is complete the total length of the Kitoy riverbank’s protection will measure more than 3km. Contact us and we will help you to find the best technical solution for your problem.